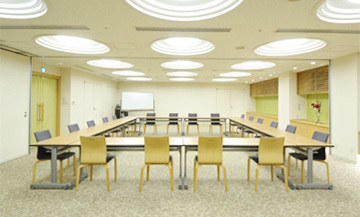 The multi-purpose room can be used in a number of ways, such as for meetings, conferences, as a party space, and as a dining area for large groups. We also can arrange rooms and dining for traveling sports teams. Please feel free to contact us with any questions, or to receive an estimate. We will prepare a party plan to accommodate the type of event and your budget. We have a number of party plans available depending on season, so please do not hesitate to inquire. 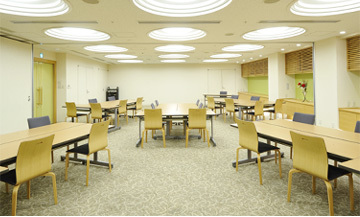 The space can be used for meetings, conferences, and seminars as desired. We also offer a conference plan with meals included. 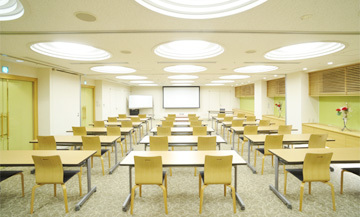 Plans that offer a set of meeting room use, guest rooms, and meals. We will provide breakfast, boxed lunch, and dinner. We also offer plans for just meeting rooms and boxed lunch, so please do not hesitate to inquire. * The space can also be divided into smaller parts. Please let us know your requests.